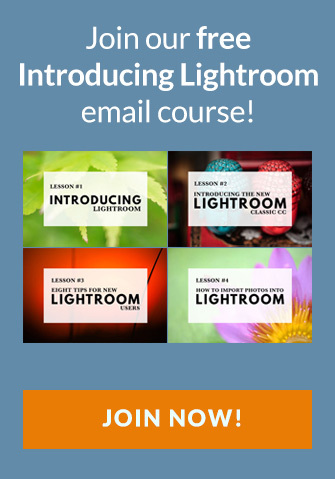 One of the questions I’m asked regularly by readers is how to use Lightroom Collections to organize your photos. This is something everybody struggles with at first when they are new to Lightroom. It takes time to work out the best way to use Collections and Collections Sets. 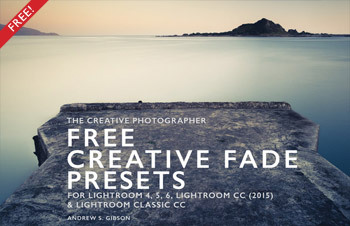 Plus, everybody is different, and Lightroom is very flexible, so there is no one best way to use Collections. Just the way that works best for you. 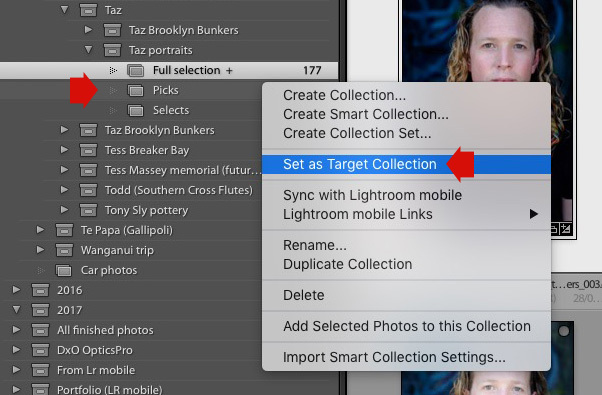 The reason why you should use Lightroom Collections to organize your photos becomes clear once we look at the differences between the Collections and Folders panels. The Folders panel tells you where the photos in your Catalog have been saved. It lists every hard drive from which you have imported photos, plus any synchronized mobile devices. The small rectangle next to each hard drive is colored gray if the hard drive isn’t connected to the computer, and green if it is. The folders on each hard drive are also listed (click the gray arrow on the right to show them). 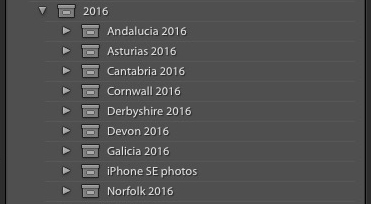 The Folders panel only shows folders containing photos that you have imported into the Lightroom Catalog. It doesn’t show you any other folders. You can’t use it for browsing photos that haven’t been imported into Lightroom. The Folders panel is only available in the Library module. Every other module only shows you the Collections panel. This is a strong hint from Adobe that Collections are its recommended way for organizing photos. Folders are limited. Without making copies you can only save a photo in one folder. This falls down as an organizational system almost right away. Let’s say you visited New York City in July 2016 and took some photos that included some street portraits, some landscapes taken in Central Park and a few portraits of your friend John. You then saved those photos in a folder called New York July 2016. You can’t add those photos to other folders without making copies. But Collections give you a lot more flexibility. Using the above example, you could create a Collection called John, another called Central Park and another called New York street portraits and add the appropriate images to each one. You could create more Collections, perhaps with names like New York 2016, Portraits 2016, Favorite Photos 2016 and so on, and add some of those photos to these Collections as well. Collections are powerful because you can add the same photo to as many Collections as you want. This gives you near infinite choice when it comes to organizing your images. For example, whenever I write a new article I create a Collection to contain the photos that I’m going to illustrate it with. Whenever I write a book I create Collections to contain the photos I want to use in the book. I have a Collection that only contains photos I am going to upload to Instagram. Each year I create a Collection containing my favorite ten photos from that year. Commercial photographers use Collections to organize their images according to job or client. Wedding photographers use Collections to organize the photos they are preparing for their clients. Collections are only limited by your imagination! Here’s the simple three level Collection structure that I use to organize my images. Level 1: I create a new Collection Set for every year. Level 2: Within that Collection Set I create more Collection sets with titles based on subject matter. Level 3: Each of those Collection Sets is divided into further Collection Sets based on shoot details. You can easily adapt this structure to your needs. Sticking to three levels makes it easier to find the Collection you are looking for. In this sense I am using the word edit to mean select the photos that you want to develop in Lightroom. Imagine the following scenario. You go out for the day and take 200 photos. 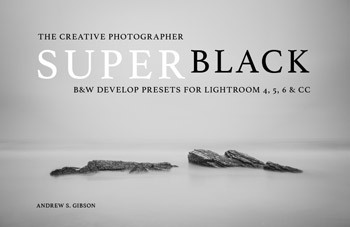 It is unlikely that you want to develop all the photos in Lightroom. Most photographers choose their best photos and develop those. Collections can help you do that. I am going to show you how using some photos I took of my friend Taz. 1. Create a Collection Set with an appropriate title. In this case I used Taz portraits. 2. Create three Collections within that Collection Set. Name one Full selection and make it the Target Collection. Call another one Picks and the third Selects. 3. Add the photos for the project to the Full selection Collection. It should look something like this. Now it’s time to sort out those photos. This is how you do it. 1. Go to the Full selection Collection, go to Edit > Select All and then press the U key to remove any flags. This ensures that all the photos in the Collection are unflagged. 2. With all the images selected, go to Library > Previews > Build 1:1 Previews. 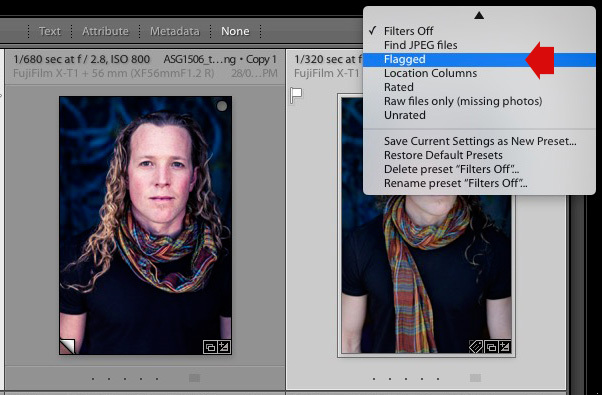 Lightroom will create 1:1 previews for any photos that don’t already have them. You can skip this step if you have already created them. Note: If there are a lot of photos in the Collection you might find it easier to select Build Standard-Sized Previews. It will be quicker to create the previews as they are smaller, but slower to zoom into any of the photos as Lightroom will have to create a 1:1 preview when you do so. You could also select Build Smart Previews which has the added benefit of making the Develop module run faster (read The Ultimate Guide to Using Smart Previews in Lightroom for more details). 3. Go to the Photo menu and, if it is unticked, tick the Auto Advance option. 5. Make your first run through the photos. Hit the P key to flag photos you like. If Auto Advance is ticked, Lightroom automatically displays the next photo. If you don’t want to flag a photo press the right-arrow key to move to the next one. 6. Go to the Filter Bar (press the \ key if you don’t see it) and select Flagged from the drop-down menu on the right. Now you can only see the photos that you have flagged as a Pick. Lightroom hides the others. 7. Right-click on the Picks Collection and choose Set as Target Collection. 8. Go to Edit > Select All, then press the B keyboard shortcut. Lightroom adds all the selected photos to the Picks Collection. As you can see, I reduced my initial selection of 177 photos down to 65. 9. Go to the Picks Collection, then Edit > Select All and press U again to remove the flags. 10. Repeat the process, this time much more carefully, making sure you only flag the photos that you want to end up in the final edit. When you have done so, repeat the process above to add the flagged photos to the Selects Collection. You can go to the Selects Collection, look through it and remove any photos (press B again) that you feel don’t belong there. The idea is to edit the selection down to the strongest photos. I ended up with 35 photos in my Selects folder. This method might seem complicated when you read the instructions but is easy to put into practice. It only takes a few seconds to create the Collections you need and then it’s just a matter of selecting the ones you want to Develop. This is the easiest way I’ve found to do this. 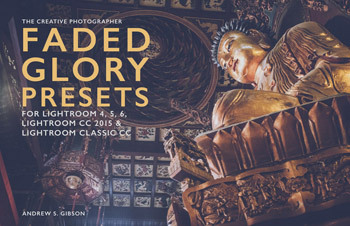 I found it on Scott Kelby’s blog (follow the link to read the article). It’s much easier than using star ratings or color labels. 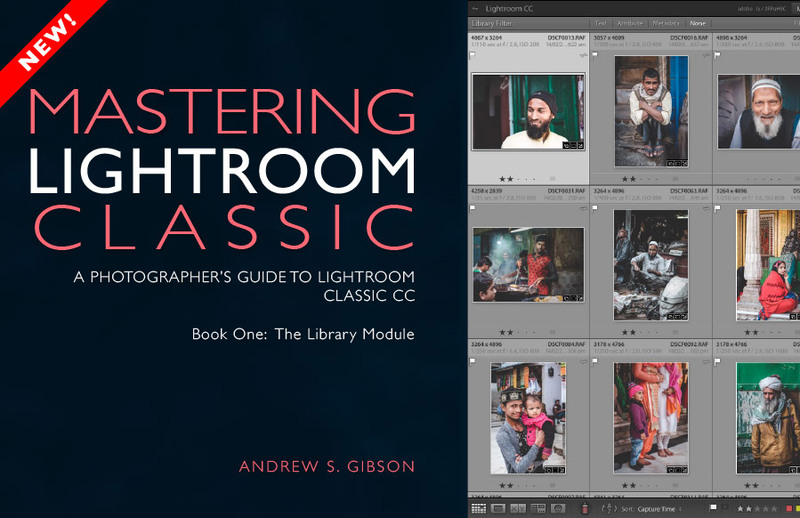 For another perspective, read Lightroom Organization in 3 Simple Steps by photographer Viktor Elizarov. The point is that you don’t need to be incredibly clever when it comes to Collections. Read up on what other photographers do and use their techniques. Better still, adapt them to suit your requirements. In the above example, if you only have a few photos to sort through, you won’t need three folders. Two will do. Or if you end up with too many photos in your Selects folder create another one called something like Final Selects and narrow them down again. You can create more Collections within the same Collection Set for almost any purpose you can imagine. Do you want to add some photos to a website? Create a Collection called Website. Add some to Facebook? Create a Collection called Facebook. Want to email the photos to John? Create a Collection called For John. Get the idea? It’s a really easy way to keep your images organized. 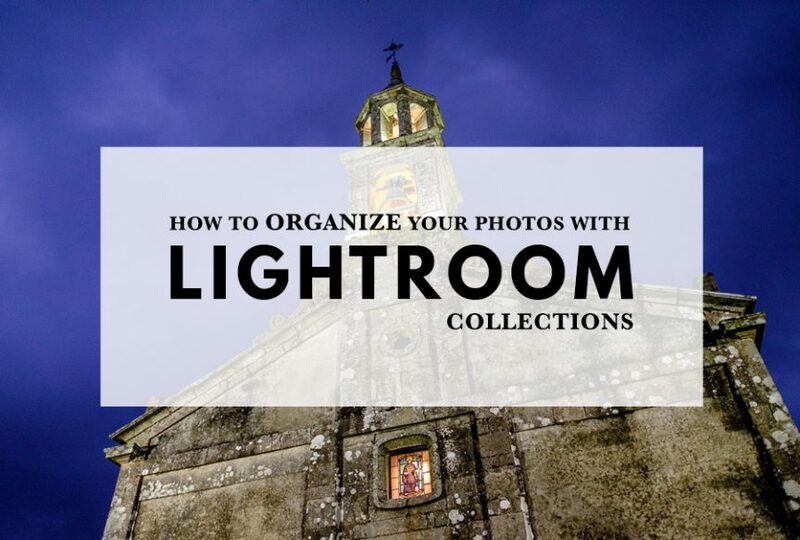 Hopefully you now understand that Lightroom Collections are a powerful and versatile tool for organizing and sorting out your photos. If you have any questions about this, or would like to share how you use Collections to organize your photos, then please let us know in the comments. I am able to create collection sets but can’t get photos into those collection sets. How do I do that? Hi Paul, Collection Sets can only hold Collections. You need add a Collection to the Collection Set, then you’ll be able to add photos to the Collection. Yes, did that but I do not understand how to add photos to the collection. I am not seeing anywhere it directs me to do that. There’s a couple of ways you can do it. One is to select the photos you want to add to the Collection and drag the selection to the Collection name. Another is to right-click the Collection name and choose Set as Target Collection. Then select the photos you want to add to it and press B on the keyboard. As a long time reader of your ebooks, I’d like to thank you for some great tips on using collections to sort & refine photos. However, I’m curious as to how you store your originals since you seem to dislike using folders within LR, which I agree with given how flexible collections are. 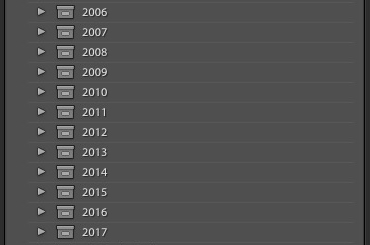 I migrated from using Aperture I have all my ‘masters’ stored chronologically (year/month/date), and I’ve been setting up yearly catalogs and then collections within that, which seems to work… so far. But getting the originals from camera/card to the computer is a piece of the puzzle I’m having trouble with now that Aperture is falling behind. So any advice or tips on your storage process would be great! This article explains how I save my photos. Let me know if you have any questions. Andrew thanks for the quick reply! Of course I found your other article just after posting my question. One question that remains is how do you import your photos? Manually or with a program like Photo Mechanic? Ive tried using LR but I always end up with the masters being imported to the wrong folder. I’m spoiled by how easy Aperture made it, and I’ve been looking for a good replacement for some time. I import photos using Lightroom. You can select the folder where you want to save your photos in the Destinations panel in the Import window. It’s quite easy once you get the hang of it. It pains me to move from Picasa – which ceased to exist – to Lightroom. Picasa was simple yet powerful, very ergonomic and flexible. I don’t find LR to be anywhere as ergonomic when it comes to organising thousands of photos. But anyway… I don’t understand why you create a 3 step Collections structure with years, then months, then specific folders, just like you do it with your photo Folders in your hard drive. You mentioned that’s what you do when you store your photos on your external hard drive in another article. Is it not repetitive? You already have those folders and that same structure. Why recreate them in Collections as well? I thought collections were just to create something like Favourite 2016. I feel I must be missing something…? Hi Ludo, good question, and I’m sure some of your confusion is down to getting used to a new system in Lightroom (I never used Picasa so I have no idea how different they are). 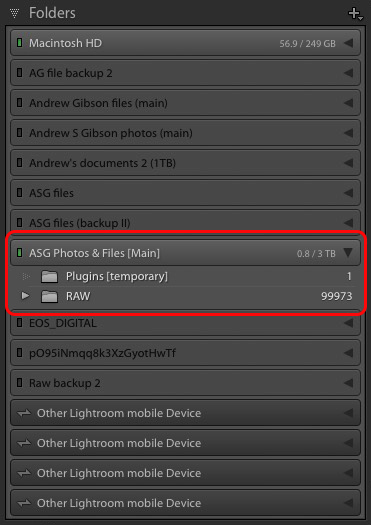 What Lightroom does is separate the storage of your photos (i.e. the folders on your hard drive where they are saved) from the organization (which is done with Collections). The main advantage of using Collections is that you can add photos to multiple Collections but of course a photo can only ever be saved in one folder. That makes Collections tremendously flexible and powerful. You could use Collections for creating something like ‘Favorite 2016 Photos’ but you would only be harnessing a fraction of their potential. Also, my Collections don’t mirror my Folder structure. I use Folders for organizing images according to date, and Collections to help edit photos (as in choose which ones to develop in the Develop module) as well as organize them according to subject, place or project. Ultimately, folders should be structured in a way that helps you back up your photos easily. Collections have no such restriction and you are free to set them up however you wish according to your own needs. Hi Andrew, thanks for all the great content and extremely well thought out e-books. Quick question, which I’m sure you’ve addressed in the past – Do you keep all of your photographs in one catalog? Or have multiple catalogs for each collection. Based on the article I’m assuming one, but won’t that bog down your hard-drive / Lightroom? I ended up splitting my individual shoots into multiple catalogs to keep my computer running lean, but it definitely slows down the workflow significantly. Hi Peter, yes I keep all my photos in one Catalog. There’s about 100,000 in there and I haven’t noticed any slowdown. According to this article by Scott Kelby it’s possible to have over a million photos in your Catalog without creating problems. 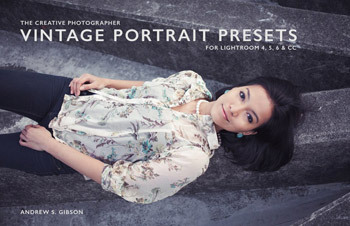 So feel free to merge your Catalogs together, it’s unlikely to slow Lightroom down. Thanks so much for the response, Andrew. One more quick question – do you keep the actual catalog on your computers internal hard drive? Or do all of your 100,000+ photographs and the catalog itself reside on an external HD? I keep my photos on an external hard drive and the Catalog on the computer’s hard drive. Lightroom would run more slowly if the Catalog was also saved on the external drive. Very helpful discussion of using Collections – thanks! One question: Why do you recommend using U to turn off all flags before adding pix to a Collection? Hi Rick, in this case it’s so you can start over flagging photos so that you can select the ones you want to add to the next Collection. If you just took those photos today, can you import them and put them into a collection at the same time? Even if you can’t, why not create previews while importing? Hi John, yes you can import photos and add them to a Collection at the same time. You do it in the File Handling panel in the Import window – tick the Add to Collection box and select the Collection you want to add the photos to. Click the + icon if you need to create a new Collection. And yes, you always create previews when you import photos, but they might not be 1:1 previews. If the photos were imported into Lightroom some time ago any 1:1 previews may have been discarded, depending on your settings. My question is if you take a photo into photoshop for a final edit how do you get that image into your final collection? Hi Lauraine, the best way to send a photo to Photoshop is to go to Photo > Edit In > Edit In Adobe Photoshop. 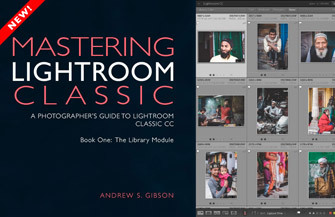 When you’ve finished in Photoshop, save the file, close the photo and return to Lightroom. You’ll see the photo you just created in Lightroom stacked alongside the original file in the same Collection. From there you can send it to any Collection you want. At each step of your Full/Picks/Selects process (which is brilliant) you have an opportunity easily to add Keywords. In fact, if you’re in a hurry, you can add most of the Keywords you really need by the end of the three-step process, then only add more specific Keywords to your Selects collection. Hi John, that’s a great idea, love it! Thank you for this great blog. Question: should one “edit/develop” a photo when it’s in the FOLDER or in the COLLECTION? It’s best to develop photos that are in Collections, especially if you have created a Collection especially for photos that you are going to develop. You normally don’t want to develop every photo in a Folder, just some of them.